(CNN) -- A new poll shows that two-thirds of Americans surveyed think the U.S. should lift its travel ban on Cuba, and three-quarters think the U.S. should end its five-decade estrangement with the country. According to the CNN/Opinion Research Corp. poll conducted April 3 to 5, 64 percent of the 1,023 Americans surveyed by telephone thought the U.S. government should allow citizens to travel to Cuba. And 71 percent of those polled said that the U.S. should reestablish diplomatic relations with Cuba, while 27 percent opposed such a move. Both questions had a sampling error of plus or minus 3 percentage points. The Obama administration has signaled that new rules on family travel and remittances to Cuba may be announced before President Obama goes to the Summit of the Americas on April 17. A group of senators and other supporters unveiled a bill March 31 to lift the 47-year-old travel ban to Cuba. "Republicans as well as Democrats favor reestablishing diplomatic relations with Cuba," CNN polling director Keating Holland said. "On the issue of lifting travel restrictions, Republicans are evenly divided, while independents and Democrats support the change." A delegation from the Congressional Black Caucus traveled to Cuba earlier this week to find out if Cuba was interested in resuming relations with the U.S., said Rep. Barbara Lee, D-California, a member of the delegation. Lee said that Cuba has no preconditions on resuming relations. The trip prompted a pair of Republican congressmen to rip the Black Caucus members for ignoring Cuba's "myriad gross human rights abuses," saying the trip to the island nation ignored the plight of political prisoners under the Castro regime. Reps. Chris Smith of New Jersey and Frank Wolf of Virginia also urged the Obama administration to refrain from easing trade embargo or travel restrictions until the Cuban government releases all "prisoners of conscience," shows greater respect for freedom of religion and speech, and holds "free and fair" elections. 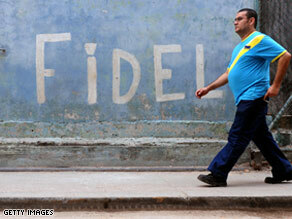 Cuban-American members of Congress, regardless of party affiliation, have voiced outrage over the easing of relations. Florida Republican Sen. Mel Martinez, who was born in Cuba, doesn't want to see changes to the embargo. Obama has said he is in favor of changing the relationship with Cuba. The $410 billion budget Obama signed in March makes it easier for Cuban-Americans to travel to Cuba and to send money to family members on the island. It could also allow the sale of agricultural and pharmaceutical products to Cuba. Three provisions attached to the omnibus spending bill loosened restrictions enacted by former President Bush after he came to office in 2001. U.S. citizens are allowed to visit Cuba, but must apply for special licenses to do so. Though it is illegal, some citizens travel to a third country like Mexico or Canada and then into Cuba. Fidel Castro led the 1959 revolution that overthrew Cuba's Batista dictatorship. The United States broke diplomatic ties with the nation in 1961. The next year, the U.S. government instituted a trade embargo. Both policies remain in effect.